Perhaps the most important and meaningful journey we can make is that of finding our place in the world. This is not a story of how I have found mine. 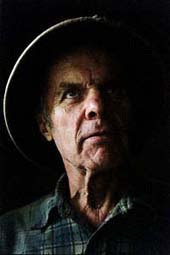 It is, however, a short story of a long journey – a 2000 plus mile journey and the first man to walk it straight through. Last week Lady Suzanne and Lady Lucy (of Greenbriar), Sir Lance (of Big Canoe) and I spent a few hours on one of the world's most famous hiking trails: The Appalachian Trail (AT), which runs from Springer Mountain, Georgia all the way to Katahdin, Maine. While on the trail I hid a Knights of Moleskine coaster in an official Geocache in the middle of the woods. 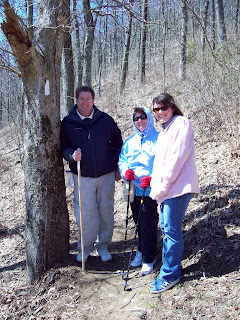 Maybe someday a hiker/cacher will find it and check out our little blog. It's estimated that 3 to 4 million visitors hike a portion of the AT each year. Around 1500 of those attempt to thru-hike the 2175 miles with most of those dropping out the first 200 miles. But amazingly to me, over 300 do complete it. This is the short story of the first man to make the long journey back when the trail was virtually unknown. n 1948, a few years after returning from WWII and the Pacific Theater, Mr. Shaffer decided to hike the trail as a tribute to his close friend and old hiking partner who was killed during the landing at Iwo Jima. I guess you can say that he wanted to walk away the war. Everyone believed that the journey was impossible when he took his first step on April 4th. Everyone, that is, except Shaffer. Every step of the way he kept a “Little Black Journal” where he recorded the people he met, conditions of the path and shelters, and obstacles -- obstacles beyond belief. A few blogs ago, Sir Dayvd of Oxfordshire shared an outstanding quote about obstacles being life. Earl's life, in part, was the trail – his place in the world. 4 months and 4 hours later (2050 miles at the time) Earl V. Shaffer overcame every obstacles the trail could throw at him and proved everyone wrong! 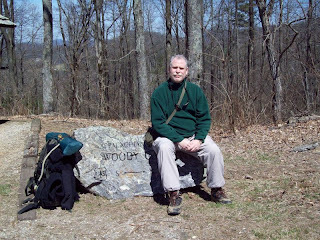 And get this, after half a century of on and off Trail work with the ATC and local A.T. clubs, Earl decided to try a third thru-hike in 1998 ... at the age of 79 years! He completed this "anniversary" hike just two weeks prior to his 80th birthday. I believe that it can be said that Earl V. Shaffer also never underestimated his own capabilities to overcome all the obstacles in his way. Good advice for all Knights who stand at the trail head of opportunities and success, filled with the vision of our own sacred journey, ready to take the next step. Earl V. Shaffer succumbed to cancer on May 5, 2002. He was 83 years old. Great story and Lesson! Fr. 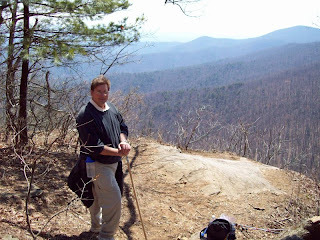 Ken Steckler just started this weekend on the trail. He's spending his sabbatical to complete the total journey. He's going to upload a blog on his church's website. Once I get it I'll forward it on. Should be an interesting journey for a very gifted and spiritual man.